Today's Image of the Day was taken by Billypix and posted to our AirSpace section. The photo depicts the flying display at EAA Air Venture Oshkosh, which is occurring all this week. Our special Oshkosh section has more photos as well as video, articles, Tweets, interactive daily magazines and more. Check it out here. When some guys retire, they buy a sports car or maybe an LSA. Art Nalls bought a Harrier, and he flew it at AirVenture this week. AVweb sent a camera along.This video is brought to you by Conoco-Phillips and Lightspeed Aviation. Visitors to EAA AirVenture Oshkosh 2010 saw two Soviet-bloc MiG-21 jet fighters in the skies over Wisconsin this week. The supersonic jets, once the pride of the Soviet air force, became symbols of changing times as the Cold War sighed to a halt. The Aviators TV The cast and crew of The Aviators would like to thank the more than 2000 people in attendance at the world premiere for helping to make it such a success. We look forward to the chance to do it one more time at the encore presentation Saturday at 6:00 pm at the Theatre in the Woods, EAA AirVenture at Oshkosh. Encore premier tonight at 6pm in Theater in the Woods! Think you're bad in the sky? Check out this practice jump at the 2010 World Parachuting Championships in Menzelinsk, Russia from TEAM USA's Freefly Team. It's been 75 years-that's three-quarters of a century-since the prototype of the Flying Fortress series took to the skies for the first time over Seattle, Washington. For so many reasons, the B-17 Flying Fortress became an American icon. For the first time, aircraft buyers and sellers at EAA AirVenture Oshkosh will be able to rely on more than handbills, want ads and word-of-mouth, as the "Spirit of Aviation Auction" will be held on the AirVenture grounds on Saturday, July 31. Mike took a few minutes in his schedule to meet up with AOPA's Vice President of Communications, Andrew Broom, at their "AOPA Live" stage at AirVenture in Oshkosh, WI. They discussed life on the road, safety, his air shows and Red Bull Air Races. Mike also explained all about his new sponsor, ASB.TV. The military today released the names of the crew members killed Wednesday evening in the crash of a Boeing C-17 cargo jet at Elmendorf Air Force Base. ... Wetaskiwin Air Show, which is to go on as scheduled, Aug. 7 and 8. The Canadian Forces Snowbirds and parachute demonstration team are scheduled to appear. Nearly two weeks ago I arrived in London for the combined marathon-&-sprint that is involved in creating social media content for a major aircraft manufacturer at one of the premier industry air shows in the world … the Farnborough Airshow. Jessica Cox is an international motivational speaker. For more information, call 520-638-6422. If you have never seen Sport Pilot Jessica Cox, she is an amazing woman. The only Sport Pilot that flies with no arms. She will make a special appearance at our August 28th Thunder Over the Coconino Fly-In & Car Show. Join us for just plane fun! I went out flying yesterday, just a short flight to help a friend confirm the indicated airspeed he was reading on his recently completed RV-6A. I stopped and refueled after the flight, taxied back to the hangar and pushed the plane back into it's parking spot. Just as I finished a stranger walked into the hangar and introduced himself. His name is Guy Keilman. His brother flies for the same airline that I do and mentioned that if Guy ever got to Stead airport he should look me up – that I have a Swift based there. Guy saw me taxi the Swift back to my hangar and was nice enough to walk up and say hi. So Much More Airventure News - Click Here! SOMBA K'E/YELLOWKNIFE - Will I have to use the parachute was admittedly among Dave Mathieson's harried thoughts at the Northern Skies Yellowknife International Air Show when his plane experienced mechanically difficulty in midair on Saturday. This is a show not to be missed. On 8 August, the Patrouille de France will hold its airshow at the airport Mouroux, Coulsdon, who, by dint of perseverance, managed to make them move. Nearly fifty planes in the French army will go from 13 am to 30 show five hours of high flying. Former cuckoos pre-war, visible them in the morning, will also present. From 10:00 to 18: 30 am, the aero-club-Mouroux Coulsdon. Price: 10 € for adults, 5 € for children under 18, free for children under 12 years. the "P‑38 Lightning Newsletter" is now available for viewing. As time passes, we are lucky enough to see not fewer, but more P-38s coming online. Check out this story to see that most recent two restoration projecs. For awhile there we were worried, but it turned out to be for nothing. Tangerine will, in fact, be able to participate in this rare aviation event. Yes, you heard that right. If you're a fan of the "Transformers" movies and/or toys, you've gotta see their version of our favorite plane! Odegaard Aviation up in North Dakota is making great progress on their second F2G Corsair. Their first was the famous race number 57. It now lives in Arizona with a new owner. Odegaard Aviations web site now has pictures posted of the restoration progress on racer number 74. Check it out here. Wow... looking good! In September 1933, four companies submitted designs for a new Luftwaffe dive bomber. Trials took place in March 1935. The unsuccessful designs were the Arado 81, the Blohm & Voss Ha 137, and the Heinkel 118. DEARBORN, Mich., July 29, 2010 – Ford Motor Company’s one-of-a-kind, aviation-themed 2011 Ford Mustang raised $375,000 for the nonprofit Experimental Aircraft Association (EAA) Young Eagles organization at an auction Thursday evening. This truly unique vehicle, in the first-ever collaboration between legendary automotive icons Jack Roush and Carroll Shelby, was auctioned during the Gathering of Eagles event at EAA AirVenture Oshkosh 2010, the world’s greatest aviation celebration. A man from Texas purchased the vehicle. Ford, the exclusive automotive partner of EAA AirVenture Oshkosh, brought together Shelby and Roush to create the SR-71 “BlackBird” Mustang specifically for the Gathering of Eagles event. To date, Ford vehicles sold at auction during EAA AirVenture events have collectively raised more than $1.3 million to support the Young Eagles. EAA’s Young Eagles provides youth education and experiences that prepare young people to become future engineers, pilots and innovators. The Young Eagles organization has provided free introductory flights to nearly 1.5 million youth since 1992, while also teaching the value of hard work, personal responsibility and enhanced math and science skills. The “SR-71” designation holds a dual meaning for the one-of-a-kind, fully-customized Mustang. First, “SR-71” refers to the car’s design and performance-inspired connection with the SR-71 Blackbird, the aircraft that holds all official airspeed and altitude records and is widely regarded as one of the most spectacular planes ever produced. Second, “SR” represents the first collaborative project between Shelby and Roush. Mustang Chief Designer Darrell Behmer led design for the project and Mustang Chief Nameplate Engineer Dave Pericak led the engineering effort. Ford Racing Performance Parts also were added to further enhance the exclusivity of the car. The SR-71 “Blackbird” Ford Mustang is Build #1 of 1 and is based on a 2011 Mustang GT 5.0. Ford racing performance modifications (Supercharger performance enhancement, Track Pack Handling Package) also were added to further enhance the exclusivity of the car and generate 100 additional horsepower from the all-aluminum 5.0l 32-valve V8 engine. The special racing Handling Pack optimizes the performance experience and lowers the ride height by 1-inch. From interior to exterior, the SR-71 Blackbird was inspired by the original aircraft. The Mustang’s design includes black and gray matte exterior paint and graphic treatment, performance wheels, front and rear fascias and an integrated spoiler/wing to mirror the car’s namesake. Reflected in the exterior paint treatment, the “Blackbird” nickname takes center stage with markings that look like the plane’s fluids streaking its exterior after takeoff. With seating for two, the interior includes a roll-cage, racing seats, embroidered signatures of Jack Roush and Carroll Shelby and special instrument cluster graphics. President Tom Poberezny. All this and more on Uncontrolled Airspace #200 "UCAP200"
Red Bull Air Race has announced that it is cancelling its races worldwide for 2011, including the only Canadian stop. The organization said Thursday on its website that it will use the time to fast-track technology to improve safety during the races, which involve high-speed flight manoeuvres through an obstacle course of large inflated pylons. Windsor, Ont., was due to host the race in 2011, after holding successful events in both 2009 and 2010. The small single-seater planes reach maximum speeds of close to 400 kilometres per hour, subjecting pilots to severe G-forces. Extreme G-forces in the turns can make a pilot feel 10 times heavier than normal. We doubt you'll ever get three quarters of a million pilots to agree on anything outside of coming together at Oshkosh during the summer — but when it comes to finding common ground, the warbirds display area is a good place to start. Everyone makes their way here at some point during the show. Some are attracted by history, others by engineering, and still others by the comic books and TV shows that drew them to magnificent aircraft as kids. The official "Last Time" DC-3 REUNION at AirVenture will be held on Thursday, July 29, at ORION, the FBO on the north side of the field at OSH at 7:30 p.m.! FLORENCE -- The thrill is in the air this weekend at the seventh Pee Dee Air Show and Festival which took off Saturday morning at the Florence Regional Airport. 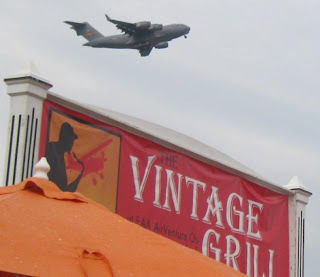 On July 5th 2010 Biggin Hill Airport Ltd. gave notice to Air Displays International Ltd. to summarily terminate the licence under which the Biggin Hill International Air Fair is run. The 25-year licence was originally granted in 1988 and had 3 years to run. The 54th Annual Tailhook Convention is just around the corner, September 9-12 to be precise! And it is not too late to get your reservations! Simply click here: [Reservation Form]. This year’s theme is Naval Aviation Training, and promises to be as informative, entertaining, and downright fun as all of our other conventions. AirVenture makes tower one of world's busiest | For one week every year during EAA AirVenture, Wittman Regional Airport in Oshkosh is one of the most popular landing spots in the world. An all-star cast of air controllers from all over the United States is assembled to make sure everything goes smoothly. "The controllers normally run this tower with five controllers, and during AirVenture, we bring in an additional 68 controllers," said Wanda Adelman who is the air traffic manager at EAA Airventure. While Boeing marked the 75th anniversary of the B-17 Flying Fortress' first flight Sunday, the flight actually occurred 75 years ago today, on July 28, 1935. Combine two old air warriors and a modern-day troubadour and the result is a star-spangled touring event like no other before: the Commemorative Air Force's Red, White & Loud Tour starring country music star and pilot Aaron Tippin and the world's only flying B29, the CAF's renowned FiFi. The Boeing B-17 joins the Douglas DC-3 in celebrating its 75th anniversary at AirVenture 2010. Have you ever seen Baker City upside down? It is just as beautiful, though it may be hard to appreciate the view while you're trying to hold in your breakfast. "OK, now I'm going to do a barrel roll," Pilot Tim Decker said just before he spun the Pitts S-2B stunt plane upside down. The view, though temporary, was spectacular. "Now we we'll just go upside down for a bit," he said. Flying 800 feet above ground in a plane that has flipped over is one thing most people will likely never do. Most would be thankful for that. Others will be envious of those who have. 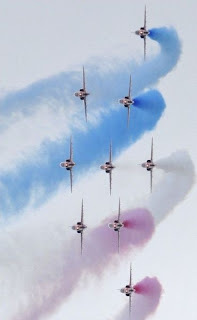 Cannes hosts a large air show Saturday, August 14 above the beaches of Mourillon with the Patrouille de France, Breitling and military aircraft in the air. ...the Commemorative Air Force (CAF) unveiled plans for an extraordinary teaming of two American treasures, the CAF's Red, White & Loud Tour starring Aaron Tippin and the B-29 FIFI. ...and more from the July news letter. Defense Secretary Robert M. Gates chats with Boy Scout Vanas Ayyar and his father, Air Force Col. Balan Ayyar, on board a helicopter flying to the 2010 National Boy Scout Jamboree at Ft. AP Hill, Va., July 28, 2010. The massive group of Boy Scouts from throughout the United States came to the 12,000-acre site for 10 days to celebrate the organization's 100-year anniversary. From the Pylon Place. We are still waiting for the final numbers and participant lists, but let’s cover what we know now. More about Goforth, you may remember him from last year. He was a fan favorite as a Rookie. Finishing only 7th in the Silver, he was better known for activities off the race course. He charmed the fans in Section 3, delighted a group of grade school kids by letting them polish his airplane. He is definitely a character and a fun addition to the sport. He will be bringing two racers this year. Invictus will be in the Gold and Knotty Girl, in her new memorial paint scheme, for the Silver. Phil was so touched by Al Goss’ generosity and friendship last year; he has decided to paint Knotty Girl to match Warlock this year. Just for one year, before she goes through a major reconstruction next year. Phil Goforth’s Knotty Girl will be dressed up in Warlock colors this year. And a late entry, Gary Davis will be there in Miss USA. Since last year’s winner in Invictus and owner of Miss USA, Thom Richard moved to the Jet Class he really wanted someone to race his plane. Gary was able to step up and take the reins. Off season networking really makes the difference. That’s the good news. The bad news is – we currently only have 13 aircraft registered for IF1 this year! It seems just a few years ago, we were turning them away at the door, now we can’t fill the seats. I’m sad to say the least, but believe that with the right programs in place, the IF1 Class will be back to its previous luster soon. Every racer I’ve spoken with has a different reason for not coming this year. Can it just be a coincidence? I hope so. While all the classes are downsized slightly, Biplanes actually has increased their number from last year. We had such a great rookie class this year at PRS, we seem to have a great future ahead of us. Tom Aberle and team will be back with Phantom, while Jeff Lo is bringing his speedy racer Miss Gianna back again this year. Norm Way will be there, with the World’s Fastest Pitts while Rookie, Karl Grove will be flying Dennis Vest’s old ride, Drag Racer. Biplanes provide some great racing - you should wake up early and come to see us sometime! Zip Andre will be there and I can’t wait to see what he has been up to in the off season. Actually – nearly everyone from the Gold last year will in attendance, including Kirk Murphy, Tony Higa, and Dave Roelofs. The real fun will be watching the Rookies come to life and watching the battle for first in the Gold between the two purpose-built racers. Which will take the fire truck ride on Sunday? Only time will tell, or as Kerch always says – Ask me on Monday! Last year, in order to create a larger differentiation between Super Sport and Sport, the class edited the rules. Super Sport will no longer be limited to production, kit airplanes and anything that has been properly tested and signed off is eligible as long as the engine is less than 1000 CID. This rule change has created some interesting entries. Team Driven is back on the potential participants list with their Suburu-powered Lancair IV. We also have the Dassault Systems sponsored Diesel NXT Racer from Big Frog Racing. This French Team will add more International Color to the races. Both Thunder Mustangs will be there, John Parker in his Blue Thunder II and George Giboney in his highly modified Rapid Travel. John and George have put together a great group of people to make the Thunder Mustangs a great racing platform. Kevin Eldredge will be there in Relentless. He has been quite busy in the off season becoming a test pilot and unintentional spokesperson for the Super Sport Class and the NXT. Mike Dacey should be there in Bad Intentions his Questair Venture, aka The Egg. Darryl Greenamyer will likely be back with Crew Chief, Andy Chiavetta’s help. Andy has been incredibly busy in the off-season. He completed his tenth Lancair Legacy and finished his new design, the Aerochia LT-1 , a light weight carbon fiber kit built aircraft. Okay, now the bad news. We are short one NXT. Jon Sharp will be taking a one year hiatus. We currently have seven Super Sport participants registered. I’m very excited to see the innovation in this class and look forward to some awesome races. The Sport Class is getting more exciting with Dave Sterling, Tom Reynolds and Lee Behel battling for first place in their Lancairs. Jeff Lavelle is looking to pass them all in his Glasair, without any pylon cuts. Ernie Sutter and Vince Walker in their Lancairs, Tony Crawford in his Questair Venture and Gary Mead in his Glasair should round out the Gold Race. Rob Monaghan is known to many race fans as “The Voice of the Sport Class”, but many fans do not know that he owns/flies a beautiful Glasair. Because of his occupation, he is unable to participate as a racer. However, his airplane is not under such constraints, so Rob’s plane will be part of the action this year. I’m hoping he choices me to fly it. Too late? Really? Maybe next year. Good luck, Rob. Nick Macy and Dennis Buehn will be battling for the right to wear the Yellow Jacket but John Lohmar, John Zayac and Gene McNeely will be giving them a run for their money. Scott Dockter will be racing both Deuce of Hearts and Margarita. Carter Clark is back, flying both Daring Diane and Midnight Rendezvous. Lee Oman is scheduled to fly Eros and Race 90. That’s a lot of pilots flying double duty this year. I hope they eat their Wheaties and drink plenty of Red Bull. The Jet class continues to attract new racers with new and interesting aircraft, with 5 Rookies making it through PRS this year and a full roster ready to take the course in September. Curt Brown and Mike Mangold will likely be battling it out in the front again this year. A little birdie told me that Mike has done some top secret upgrades this year in the hopes of dethroning the king. Look for some interesting aircraft in the Silver including the Jet Provost flown by Steve Picatti and the Iskra (Polish for “spark”) flown by F1 Champion, Thom Richard. Heather “Lucky” Penney, daughter of John Penney, will be racing #21. She is currently an F-16 pilot for the DC ANG and quite an accomplished aviator. Her team is quite supportive and should make a splash while at the races. Yes, Strega will be back. Tiger says LD Hughes and the team have been working on “secret squirrel s#it” to make Strega go even faster. Recent college graduate, Steve Hinton, Jr will be in the pilot seat once again. They are clearly the team to beat. Strega and Stevo Hinton will be back to take on challengers this year. Rare Bear is ready. Last year, they were working late nights to get her flying again in time for the races. This year, they were flying in June. John Penney will be in the pilot’s seat once again. Expect to see long time Alternate Pilot, Stu Dawson, in the seat for at least a qualifying session or even a heat race. Stu spent several days working with John and has flown The Bear a few times. Both are accomplished pilots and will make it interesting in September. Dan Martin will likely be back in Ridge Runner and Hoot will be flying Riff Raff. But, what will Matt Jackson fly? Will it be Furias or Dreadnaught? Both are on the list and both are capable of Gold numbers. I guess we’ll wait and see. Will Whiteside will be back in Voodoo. The Voodoo Team has been making some major changes to the Purple Princess. And with Bob Button as their leader and Bill Kerchenfaut watching over the mechanical bits, this will be one to watch. Now, for some bad news, Czech Mate will not be there. They are looking to make some changes for speed and safety in the future. I hope to see her back again soon. Also, Howard Pardue apparently meant it this time when he retired. So, Howard and Nelson Ezell will both be out of the action. Also, Stu Dawson is not going to bring Spirit of Texas this year, terrible news for the Texans in the crowd. I’ll continue the bad news by saying that Bad Attitude has been sold and Argonaut is taking the year off. And it looks like neither of the P40s from last year will make it this time. But, there are bright spots, for example – all of the fans who were hoping to see a Tigercat back on the pylons, well, get ready, because now there will be TWO Tigercats. Rod Lewis heard your pleas and will be bringing both Here Kitty Kitty and Bossman. There is also a FW190 on the participant list. I believe it is the Planes of Fame FW190 and should attract the crowds in the Pits. Also, John Maloney will be racing Steadfast this year. I’m glad such a talented pilot/racer will be with us again this year. Now, before you ask, YES – Galloping Ghost is on the list and there is photographical and video evidence that she is not actually a ghost. She has been seen flying through the skies near the Minden Airport. And let me just say, the fans are THRILLED! Good luck, Jimmy! The Canadian Snowbirds are back this year, along with David Martin. Kent Pietsch with his comedic aerobatic act will thrill the crowds again this year. Bill Braack with the Jet Car will also be there. Greg Poe will be back. This year he will be flying his Ethanol Powered Fagen MX2. Is this a nod to the green fans? But, the star of the show will be the SIX P-38s that will assemble in the high desert in September. This will be quite an event. My understanding is every flying P-38 will be there at Reno. Now, that’s pretty exciting stuff. I hope you can make it. As always, Ruby Red Racing is looking for sponsors to help defer the costs of participating in the National Championship Air Races. Contact me through the magazine for more information about how you can get involved. Until next time, Fly low, Fly fast and Turn Left. Air Show at Geneseo, NY.